New technologies often bring benefits, but they also sometimes displace technologies and behaviors from earlier times that were charming and beneficial. 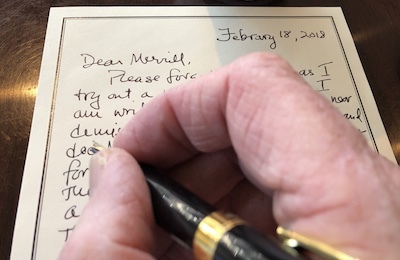 Back when I was a kid in boarding school (1960-63) and then in college (1963-67), the handwritten letter and card were a crucial part of adolescence. While Americans continue to send greeting cards, far fewer people now take the time to write a letter and mail it than previously. Back then, part of the thrill was the waiting — checking the incoming mailbox to see if your heart's desire (at the time a girl named Shelley who went on to be a Charlie's Angel) had answered your most recent letter. How odd it is now to realize that waiting enhanced the experience. First Class Mail is Doomed. Get Over it. Consider that in 2002, there were 102.4 billion First Class letters delivered across the United States, but in 2012, that had fallen to just 73.5 billion -- a stunning 28% drop in just a decade. For a parallel, you could look to another victim of the times, the landline phone. In 2003, the Centers for Disease Control conducted its first study of wireless only homes and found 3% had dropped the landline. Today, that number is 34%. Everything in First Class has left the category faster than anticipated. Bills, payments and general business correspondence have gone online. Personal letters? Obviously, they're nothing but a quaint anachronism. The Post Office reports "Total First-Class Mail Volume for 2016 was 61.2 Billion." This decline is understandable as email and online services offer speed, immediacy and convenience, but this article suggests holding on to what Rogowsky argues above is "nothing but a quaint anachronism." Schools should help students to understand the power of certain older technologies to deliver genuinely caring, intimate messages that new technologies may not be able to match. They might not send handwritten cards or letters often, but they should know that when they do make this choice, the recipient is likely to value their message far more than they would if transmitted digitally. In some cases, their card or letter will be treasured - saved and read many times. While first class mail has declined dramatically, Americans still buy lots of greeting cards to mark special occasions like birthdays, to express sympathy or to proclaim love. Many people pick a card that contains a message that fits the occasion and do little more than sign their names at the bottom. 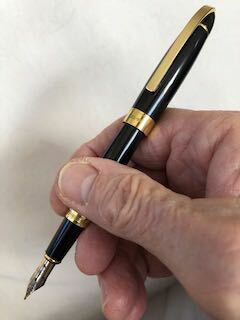 This is all well and good much of the time, but we want our students to understand the power of adding their own words written longhand, and if possible, in script. This type of communication becomes especially apt when writing a love letter, a sympathy card or a letter of appreciation. Americans purchase approximately 6.5 billion greeting cards each year. Annual retail sales of greeting cards are estimated between $7 and $8 billion. The most popular Everyday card sending occasion by far is Birthday, followed by a number of secondary occasions that include Sympathy, Thank You, Wedding, Thinking of You, Get Well, New Baby and Congratulations. The most popular Seasonal cards are Christmas cards, with some 1.6 billion units purchased (including boxed cards). This is followed by cards for Valentine’s Day (145 million units, not including classroom valentines), Mother’s Day (133 million units), Father’s Day (90 million units), Graduation (67 million units), Easter (57 million units), Halloween (21 million units), Thanksgiving (15 million units) and St. Patrick's Day (7 million units). "You can analyze your writing according to form, pressure, size, slant, zones (upper, middle and lower zones), t bars, layout (margins and spaces between letters, words and lines) and more in our website." Because when students are in middle school and high school, their own style of handwriting is still developing, it pays to make them conscious of this development so they will work to establish a consistent style that matches their personality. Visits to graphology sites like the one above can help raise student awareness. The carefully crafted, handwritten love letter, sympathy card or letter of appreciation will make a stronger impression than something that is dashed off or sent by email. In addition to personalized, stylistically pleasing, intimate handwriting, well chosen words coming from the heart will add to the impact of the message far more than the commercially printed words of a greeting card. We want our students to realize that sometimes the older technologies may have advantages over the new ones. Written materials, art work and photography on this site are copyrighted by Jamie McKenzie and other writers, artists and photographers. Written materials on these pages may be distributed and duplicated if unchanged in format and content in hard copy only by school districts and universities provided there is no charge to the recipient. They may also be e-mailed from person to person. All other uses, transmissions and duplications are prohibited unless permission is granted expressly. Showing these pages remotely through frames is not permitted. FNO is applying for formal copyright registration for articles.